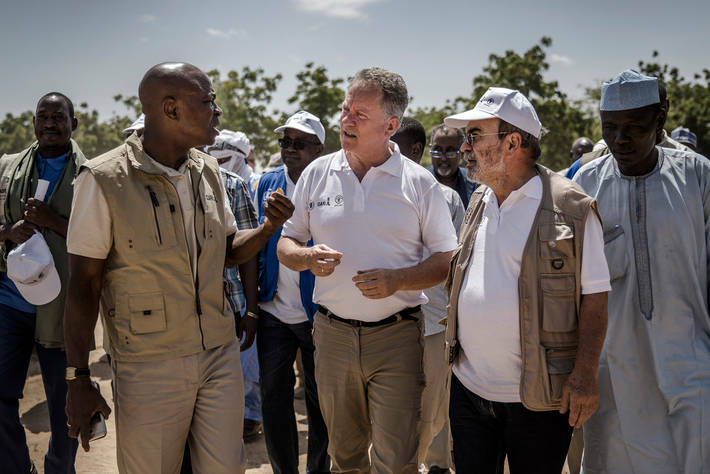 FAO Director-General José Graziano da Silva, IFAD President Gilbert F. Houngbo, and WFP Executive Director David Beasley, made the commitment as they wrapped up a four-day visit to Niger that included meetings with President Mahamadou Issoufou and Prime Minister Brigi Rafini. The three UN agency chiefs visited several projects where collaboration among FAO, IFAD, WFP, the Government of Niger and other partners, is providing people with new opportunities to feed their families and to build livelihoods that are more resilient to extreme weather events and other shocks. “Working closely together FAO, IFAD and WFP are making a difference in the lives and livelihoods of some of Niger’s most vulnerable people. We will strive to build on one another’s strengths and continue working with governments, donors and other partners to scale up our efforts throughout the Sahel region to achieve Zero Hunger,” Graziano da Silva said. “We can only hope to break the cycle of conflict and hunger if we work together, treating every humanitarian challenge as an opportunity to help develop economies and increase stability. In Niger and throughout the Sahel, that’s what our three agencies are doing — along with national partners like the Government of Niger — and we can already see how it is paying off,” Beasley said. The Sahel, whose population of 140 million is expected to more than double by 2050, has among the highest poverty rates in the world. This, together with changing weather patterns, will put increasing pressure on already scarce natural resources and is likely to generate more conflict – especially between pastoralists and households involved in crop production – while also forcing people to abandon rural areas in greater numbers. In Niger, as in other parts of the Sahel, FAO, IFAD and WFP are jointly focusing on addressing poverty, underdevelopment, climate shocks and migration – factors that have all contributed to the region’s critical humanitarian and security situation, one that affects women and girls in particular. A series of projects in Dargue in the Niger’s southern Maradi region visited by Graziano da Silva, Houngbo and Beasley are an example of where the three UN agencies’ work is making a difference. Initiatives, such as a land rehabilitation programme, water management systems and a central marketplace, illustrate the vital link between humanitarian and development assistance for peace building in the region. Graziano da Silva, Houngbo and Beasley also underscored the importance of community and government-led initiatives, such as “Les Nigériens nourissent les Nigériens” (Nigeriens feeding Nigeriens) backed by FAO, IFAD and WFP together with other partners. This initiative, which aims to reduce poverty and build resilience to food crises, seeks to boost the productivity of agricultural and pastoral land by strengthening local capacity through the introduction of better farming and herding practices and improving infrastructure, such as roads and health centres and school canteens.